We know that employees are looking beyond what their Learning & Development departments have to offer. They’re choosing to learn in different ways from a much more diverse range of sources. Meanwhile, most L&D infrastructure is still geared for the same old thing — managing formal training.It’s time to meet, and embrace, the new learning ecosystem. Here’s how you can leverage it. 1. Learners want faster, easier answers. The easiest way to find an answer or learn something for their jobs is to Google it and watch or read what they find. We’re doing this because in many cases it’s efficient and all we really need. 2. Learners need more diverse options. They want to learn in many different ways–not just from courses and formal training programs. In fact, more than 70% of people have learned something for their job from an article, a video, or a book in the last 24 hours. Unfortunately, most of that learning is outside of the view of the L&D or HR process. 3.Learners want to leverage the entire learning ecosystem. Most workers told us that up to 60% of the knowledge and skills they use at work come from informal training. In addition, 90% said they would prefer to be given credit for their own learning vs. learning at L&D or HR’s direction. We need to start valuing informal learning- which could be a big, under-leveraged tool for building learning culture.You can try to change everyone else’s preferences and habits or you can change how L&D works. The difficulty is that while the way we’re all learning has evolved, the way many L&D organizations invest hasn’t really. Right now most systems are set up for command-and-control, one-to-many broadcast approach. In order to put learners first, the people and processes, the programs and content, and the tools and technology systems all need to reflect this new reality. Say hello to the new learning ecosystem. 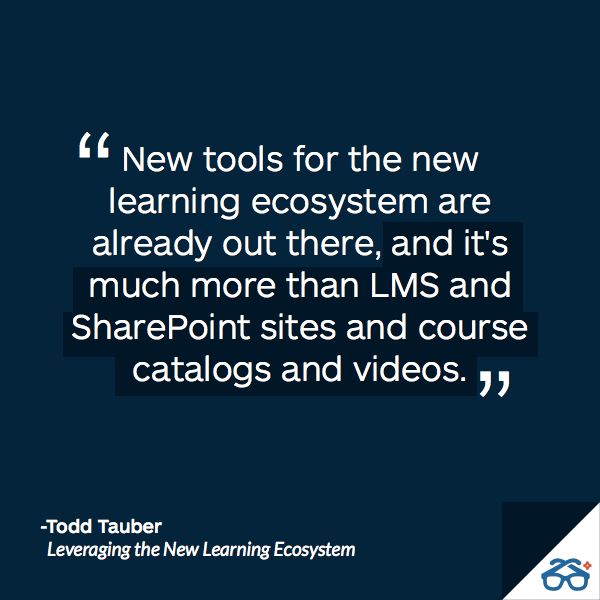 The tools to help you leverage it are already out there, and it’s much more than just LMSs and SharePoint sites. Look past proprietary or vendor content. Embrace alternative formats and sources. Do more than just build, buy, and push content. Crowdsource, curate, and assemble it. 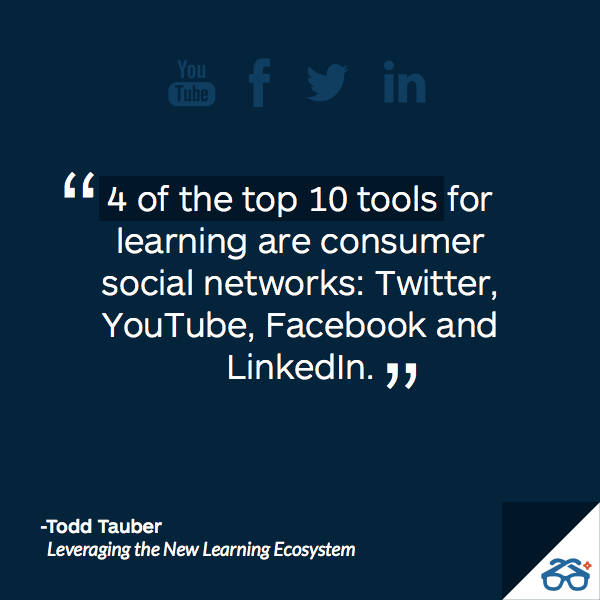 Remember that 4 of the top 10 tools for learning are consumer social networks. Empower your learners to crowdsource and assemble content too! Measure more than formal training. Track, recognize, and value all kinds of learning. There’s no excuse: You should be recognizing and valuing all kinds of learning. This means measuring more than formal training. New ways of learning demand different kinds of infrastructure. Infrastructure that empowers. New tools, content and technologies are essential for re-engaging learners and reconnecting L&D to business. By focusing on some new priorities, incorporating some new approaches, and rebalancing your investments you can leverage this new learning ecosystem to make L&D better serve your learners. To discover how we can help you empower learners and leverage the entire learning ecosystem check out get.degreed.com.